Back in April, we introduced an Alpha version of BitTorrent Sync: a new product designed to help sync files across devices, friends, collaborators, and co-working teams. Sync is a response to what we see as real, fundamental challenges to personal data movement: the limitations on speed, size, space, privacy, and security that come with cloud dependency. BitTorrent Sync is free, unlimited, and secure file-syncing. It’s designed for fast file transfer: between users and machines; between editors and collaborators. Since April, Alpha users have synced over 8 petabytes of data; applying BitTorrent to classroom setups, film collaborations, remote backup, data storage, blogging, and project management. Pretty massive. It’s with the contribution of these intrepid early users that we’ve been able to evolve and build out the next step in syncing. 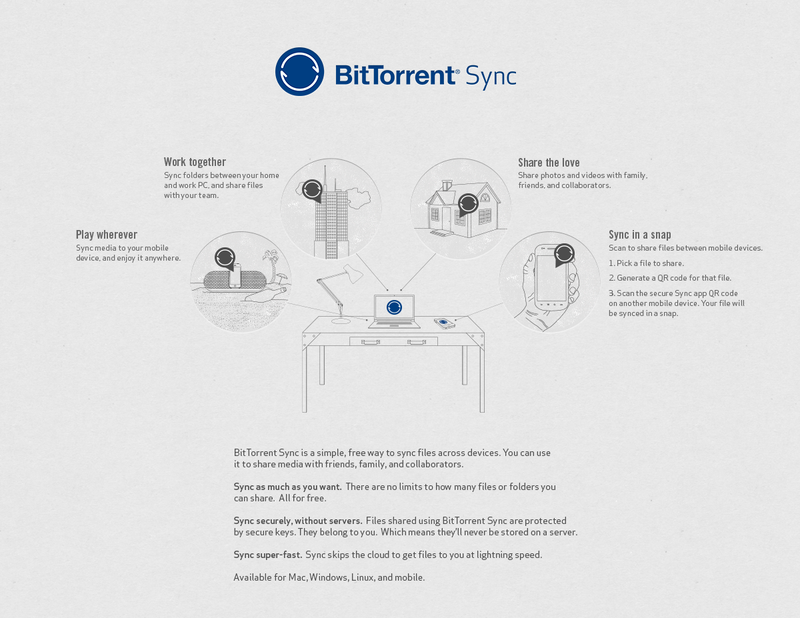 Today, we’re happy to announce the release of the BitTorrent Sync Beta. The new Sync Beta includes two of our Alpha users’ most requested features: mobile syncing and archiving. Here’s what’s new. You guys asked for it. We built it. BitTorrent Sync is now available for use on your Android device. You can sync up work folders to your tablet, backup mobile photos, and share files directly to friends and collaborators, right from your smartphone. iOS users: we haven’t forgotten about you. Stay tuned for updates on this front. The BitTorrent Sync Beta also includes a basic versioning capability: a folder that gives you access to archives of previous versions of your synced files. Many thanks to our Alpha users for the awesome input, ideas, and feedback. We’re excited about what’s next. Brett leads Product Management and User Experience at BitTorrent. Is there support for version conflicts yet where the file differs on two clients and both copies are new ? Are there any other known scenarios that can lead to data loss?